ABORTION-- Zeal and Bible based authority lead this section of the Journal. and passing it on to you. We only post articles representing zeal and Bible based authority to lead this section of the Journal. This page is not meant to make you comfortable and cozy. This page is a memorial to those 70+ million victims of genocide perpetrated by the House, Senate, Presidents, Dumbocrats and Republiwimps, Clinton, Carter, Ford, both Bushes, Reagan, Obama and about 98% of American political leaders, and most citizens of the USA who CHOSE to murder the defenseless unborn. Damnation and hell fire to them all. OPERATION OF THE CENTURY-- A little guy grabs hold of a helping hand! SELLING BABY PARTS FOR PROFIT-- These people are worthy only of death. Editor: Steve Van Nattan- One of these days, the Italian government will be paying Luigi Basko to move back to Italy. And, the USA may one day be setting up recruiting centers in El Paso and Tijuana to enlist Mexicans to become US citizens. And we wonder why the One Worlders are calling for depopulating Africa and Asia. We NEED these people to pay our Social Security! We should be HIRING them, not killing them. Mark it down! A report follows which was sent from Michigan along with photos of the display of Dr. Graeser which he put up on the lawn of his home. Dr. Graeser is not living in a shack on the property, nor is he doing this because he is living on welfare and has nothing else to do. Without exalting him, let me only say that he is pulling his load in the world. His zeal is worthy of note. In the Fall of 1997 Dr. Graeser, a 56 year old physician, added the 8 foot by 12 foot, outdoor painting shown on this card to a sanctity-of-life display already on his lawn. He had been dismayed at how the media ignored the plight of unborn, aborted children, and his previous work as a pathologist seeing the bodies of these victims instilled in him a desire to protect their lives. As a result, he constructed on his 20-acre, rural, home site, a permanent display which is located on a highly traveled road between two towns in western Michigan. 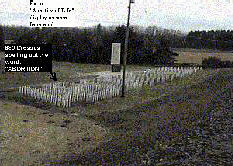 He first placed white, wooden crosses in the ground to represent the 750 abortions performed each working hour nationwide. 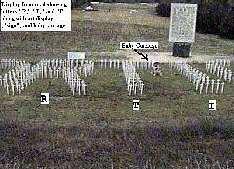 The crosses were placed so that they spell out the word ABORTION in capital letters. An empty baby stroller, a lonely reminder of the babies who will never he born, rests among the crosses. A few months after he first set up the cross display vandals destroyed crosses making up four letters of the word destroyed ABORTION. Dr. Graeser then replaced all the wooden crosses with ones made of white, steel fence posts, welded together, buried 3½ feet in the ground to discourage stealing and vandalism. Three years later he added the painting. Response to the display has been overwhelmingly positive. Once, when arriving home at dusk, he noticed two women standing at the foot of the painting. Concerned that it might be feminists intent on inflicting damage, he watched from a discreet distance. To his surprise, the two women were holding a private service. After the painting was up for two months, the zoning administrator cited Dr. Graeser for violating a sign ordinance. The situation made the local papers, and petitions were circulated in support of the display. The zoning board met, and Dr. Graeser presented his case. He stated that the Constitution provided for free speech and free expression of religion. He said that these constitutional rights superseded the local ordinance prohibiting the sign. Well, there was quite an argument - quite a controversy, but when the votes were counted, the zoning board agreed with him and dismissed the case. The display continues to proclaim God's pleasure with life. The Mother walked into the Doctor's office, carrying a bright and beautiful baby. Seating herself near the family physician, she said, "Doctor, I want you to help me with my problem. My baby is one year old and I've conceived again. I don't want to have two children so close together." "Ah," said the Doctor, "and what would you have me do?" "I want you to get rid of it for me," answered the woman. After thinking seriously for a moment, the Doctor said: "I think I can suggest a way of helping you out. If you object to two children being so close in age, the best way would be to kill the one on your lap and let the other one be born. It's easy to get at the one on your lap and it makes no difference to me which one I kill. Besides, killing the unborn baby may endanger your life." With that the Doctor reached for a knife and casually asked the Mother to lay the baby down on her lap and turn her head away. The woman leaped up from her chair and screamed, "Murderer!!" A few words from the Doctor soon convinced the woman that his offer to commit murder was no worse than her request to him to destroy her unborn child. In either case, the act would be murder; the only difference would be the age of the victim. Recently, a mother paid a man to kill her young boy, who was hacked to death with a sharp instrument, cutting off his right arm and severing his head. The woman, who was unrepentant, said it was her "right" to do so because the child was interfering with the quality of her lifestyle. The counsel for the prosecution submitted grisly photos of the corpse and said, "No mother has the right to take her child's life," and charged the woman with murder. Of course, the killing of children isn't news in the U.S. where over 25,000,000 babies have been murdered in the name of "freedom of choice." This gruesome picture of a seven month boy, whose right arm and head were ripped from his body by an abortionist in Houston on December 8, 1989, shows that this is not just a "fetus" or the "woman's body." If you are not shocked by it, then be warned that, even though the law of America gives you the right to take the life of another through abortion, God's Law says, "You shall not kill." Perhaps you have never had an abortion, but did you know that the mere desire to kill someone violates His Law? The Bible says if you hate someone, you have committed murder in your heart. In fact, the greatest of all the Commandments is to "love the Lord your God with all your heart, mind, soul and strength, and to love your neighbor as yourself." When someone asked what that meant, Jesus gave the story of the what we generally call "The Good Samaritan." This Samaritan found a man beaten by thieves. he bathed his wounds, put him on his donkey, took him to an inn and asked that the man be looked after. He also said, if he spent anything, he would repay the innkeeper when he returned. Actually, this "good" Samaritan isn't called good in the story, as he merely did the basic requirements of God's Law in loving his neighbor, as much as he loved himself. The fact is, we are all guilty of breaking this, the greatest of all the Commandments. Our selfish nature often has trouble tolerating others, let alone loving them as much as we love ourselves. Listen to the voice of your conscience, and let it remind you of some of the sins of the past. We are not perfect as the Bible commands us to be (Matthew 5:48), neither is our heart pure. On Judgment Day our transgressions will be evidence of our shame. Think of it: God has seen every sin we ever committed, whether it was the taking of another's life, or wishing we could do so, by harboring hatred in our hearts. We share our thought-life with Him. We are guilty of violating His Law a multitude of times yet if we repent, God can forgive us because Jesus stepped into the courtroom 2,000 years ago and paid the fine for us. His death on the cross satisfied the Law we so blatantly transgressed, and at the same time demonstrated how much God loves us"For God so loved the world, that He gave His only begotten Son, that whosoever believes in Him should not perish but have everlasting life." His shed blood on the cross can make you clean in the sight of a holy God...as though you had never sinnedeven if you have committed murder. Moses, King David, and the Apostle Paul committed murder, and God's grace was sufficient for them. God doesn't want you to go to Hellrepent and put your trust in Jesus, make Psalm 51 your prayer, then read the Bible daily and always obey what you read; God will never let you down. Father Trosch, a Catholic priest, has become famous for advocating the murder of doctors. In his view, killing doctors is "morally obligatory." "The fact is that there will be numerous Christians in this country -- eventually becoming many millions -- who will finally come to grips with the knowledge that their belief system says, "murder of innocent human beings is taking place daily throughout society." They will come to understand that God will hold them accountable for not taking direct action to prevent this evil. When this becomes their accepted faith belief and the normal constraints of pacifism, which pervades throughout this country, is overcome, then we will see the beginning of massive killing of abortionists and their staffs. In time the killing, in protection of the innocent, will begin to spill over into the killing of the police and military who attempt to protect them. Thereafter it will begin to affect those who direct them to protect abortion providers. This will include, but not be limited to, city councilmen, mayors, governors, representatives, senators, the president and his staff, judges, and others seen in any way as fostering protection of mass murderers. They will be sought out and eliminated as all grave evil should be purged to keep it from contaminating society (the bad apple in the barrel concept). Members of the American Civil Liberties Union will place high on the target list. Members of the National Organization for Women, members of Planned Parenthood and other pro-abortion/choice organizations will be sought out and terminated as vermin are terminated. It will be seen as a necessity for the defense of innocent human life." Side note: It is the policy of the Catholic Church that a woman who has an abortion is automatically excommunicated. In the case of this man who openly encourages others to commit murder, the Church has not acted as strictly. Although Father Trosch has been relieved of all duties, he remains a priest. We do not cooperate with the devil's mob in order to do good. Note the insane coming together in the following quote. This is Satanic, for it uses the alleged good done to resist the murder of abortion to ecumenize alleged saints with the Whore of Rome. They will not kill babies, but they will chew on Jesus. "On Sunday January 21st at First Assembly of God on Phyllis Place at 6pm there will be a county-wide memorial service for the unborn. The Catholic Mass is scheduled in the afternoon so parishioners may attend and then join the memorial service. The memorial service is put on by the Association for Life which includes the diocesan office of social ministry. The speaker will be pastor HB London from Focus on the Family. "The memorial Service has been especially touching these past few years, " says Rosemary Benefield of Rachel's Hope, "40 volunteers, one representing one million abortions since Roe v. Wade, walk the procession with a candle and a rose. The candle is blown out and placed in a cradle for the babies and the rose is placed in an empty rocker for the mothers. It is a graphic reminder to us all what our nation has lost." Music will be performed by Project Grace. For more information (760) 741-4010." Hillcrest abortuary in Baltimore suffered a little embarrassment on Saturday, March 12. While a few dozen of the nation's abortionists were gathered in Pensacola to enjoy the fellowship of darkness, blood was literally flowing in the streets following the labors of one of their hard-working comrades. --- was too busy slaughtering babies to confer with his fellows in Pensacola on the latest techniques in child dismemberment. But the flushing of baby parts down the drain led to some problems. Two sidewalk counselors were standing by when the clean-out drain broke open at approximately 11:45 a.m. Blood poured into the parking lot. Customers of the nearby pancake house came out and one of them cried "This is the sin of abortion!" and then called police. Police arrived at noon and made a report. Sharon Thomas, local anti-abortionist on the scene, told the story on the Alan Keyes radio program. She had called various authorities including a state environmental agency. The hack who arrived could only cast doubt on the abortuary being the source. (He had no other suggestions.) Chunks of what appeared to be human flesh was taken by Thomas to a lab for examination. Strange, but wondrous, how Providence exposes the deeds of darkness. The blood of the innocents, slaughtered in obscurity, is poured into the very streets for citizens to witness as they calmly eat their pancakes. We must never forget the evil that is the Liberal. In the early sixties, before the advent even of Ortho Pharmaceutical's " The PILL", a certain category of liberal was opposed to abortion legislation. They said it would be tantamount to genocide against the blacks of America. They called it a conspiracy by Conservatives. After the first abortion clinic opened at Whitestone General Hospital in Astoria Queens, New York, it was apparent that 99.44% of the babies aborted by Dr. Art SOLOMON belonged to single White girls under the age of 17. IMMEDIATELY and without further ado, that same identifiable "group" of liberals did an about face and became the most vociferous voice of the pro-abortion movement. Where Route 71 crosses over Payton Drive, at the bottom of the steeply sloping embankment, two boys, who were playing nearby, found the boxes. The boys bicycled home and said they had found boxes of "babies." Do not be impatient with the imprecision of their language. They have not read the apposite Supreme Court opinions. So when they stumbled on the boxes stuffed with 54 fetuses, which looked a lot like babies, they jumped to conclusions. Besides, young boys are apt to believe their eyes rather than the Supreme Court. The first count came to a lot less than 54. Forgive the counters' imprecision. Many fetuses had been dismembered -- hands, arms, legs, heads jumbled together -- by the abortionist's vigor. An accurate count required a lot of sorting out. The fetuses had been dumped here, about 30 miles east of Los Angeles, on March 14, 1997, by a trucker who may not have known what the Los Angeles abortion clinic had hired him to dispose of. He later served 71 days in jail for the improper disposal of medical waste. Society must be strict about its important standards. In the Old Testament days of Moses, these ACLU people would have been stoned for justifying the murder of the innocent. The ACLU is worthy of total destruction in whatever way our Lord so leads. If the "Cradles of Love" people had been burying lumps of meat they bought at the grocery store, no one would complain, not even the ACLU. It is also interesting that most ACLU lawyers are Jews. I find it ironic that those who claim to follow the law giver Moses are the most eager to kill babies. Could it be that these Jewish lawyers see this as a way to kill Goyim without being held to account by society-- a sort of revenge for Auschwitz? The fetuses involved were defined by modern thought as nothing more than refuse, or lumps of discarded meat. In preventing these alleged lumps of meat from being used in a religious ceremony, the ACLU legally and lawfully is agreeing that they are persons, that they have rights, and that they cannot be given a religious treatment against their own will. Are you thinking dear reader. This shows that the ACLU lawyers are Satanists, they hate God and the order of His Holy nature. They, in bitter hate for God and His people, attacked and defended, not lumps of meat-- Rather, the ACLU gave clear personality to those fetuses as they defended their rights. In this I agree with the ACLU-- They were defending persons. Thus, the ACLU, de facto, agrees that abortion is the murder of persons. This is very helpful of these atheist bigots. So, when the ACLU defends the rights of abortionists, the ACLU KNOWS it is participating in murder. According to the law of Moses, every attorney of the ACLU, who participates in this defense of murder, is worthy of death "by any means possible," (as Henry Kissinger says in his National Security Memorandum on global death and elimination). Is it not astounding that so many alleged Jews are attorneys in the ACLU?